As fixed income investors concerned with protecting the value of client portfolios, two interesting charts for us at present are the outlook for US as well as Australian inflation and the level of volatility in fixed income markets. A liquid market exists for both measuring and trading US inflation expectations due to the existence of Treasury Inflation Protected Securities or TIPS, which pay a coupon and principal indexed to consumer price inflation. TIPS can be compared with the yields on regular Treasury securities to derive the market’s expectation for inflation, both near term and into the distant future. Similar securities exist in Australia, known as inflation linked bonds (ILBs). The charts below show the implied rates of inflation priced into these securities – as you can see, the future rates of implied inflation are very low even out well into the future. The US treasury bond market is also the most liquid, transparent and heavily traded fixed income market in the world, meaning that substantial amounts of data exist to assess this trading activity. Where equity investors have the VIX, which is an index of the future expected (otherwise known as implied) volatility inferred in the prices of exchange traded options on the S&P 500, fixed income investors have the MOVE index – the Merrill Lynch Option Volatility Estimate – which is a similar concept except it is applied to the US treasury bond market. What these charts are currently telling us? Since November 2016, the surge in US growth expectations on the back of Trump’s victory has been the key driver of the rise in nominal interest rates. These expectations consolidated in the first few months of 2017 as markets awaited new direction, which came last week in the form of the latest US jobs report. This report essentially gave the Federal Reserve the green light to raise US short term interest rates. Consequently, the US 10-Year treasury yield soared from around 2.30% to over 2.60% and now sits at its highest point since 2014. The Australian 10-Year treasury yield has also followed suit and now sits just below 3.00%, which are levels that have not been seen since late 2015. What is surprising to us is that financial markets have moved to price a higher Fed funds rate and higher bond yields, and yet market pricing for inflation is flat for the next 30 years. 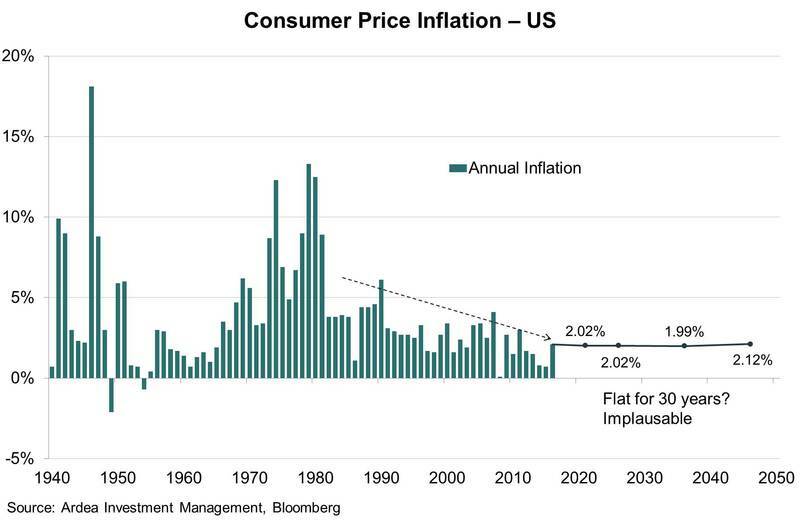 This means that markets are prepared to bet that US inflation will average 2%, each year and every year, for a very long time. This would be optimistic at best, but in the current environment where risks to inflation are rising with each passing day, it seems almost surreal. Volatility is an esoteric concept that can have different meanings to different people. To most people, volatility is a measure of historical risk – technically known as realised volatility. Higher realised volatility means that the price of something has larger movements compared to its average value over the time-period being measured. But markets are forward looking, not backward looking, and what indicators like VIX and MOVE tell us is that investors are expecting markets to continue to stay in a narrow trading range for the foreseeable future. The fact that these indices have been forecasting low volatility for some time now also indicates to us that markets are complacent about the downside risks in equity markets, and expecting bond markets to continue to stay in a narrow trading range. This is why volatility indexes like VIX and MOVE are often called fear indexes, because a sudden change in investor preferences is reflected as a sharp rise in volatility and a sharp rise in the price of options. 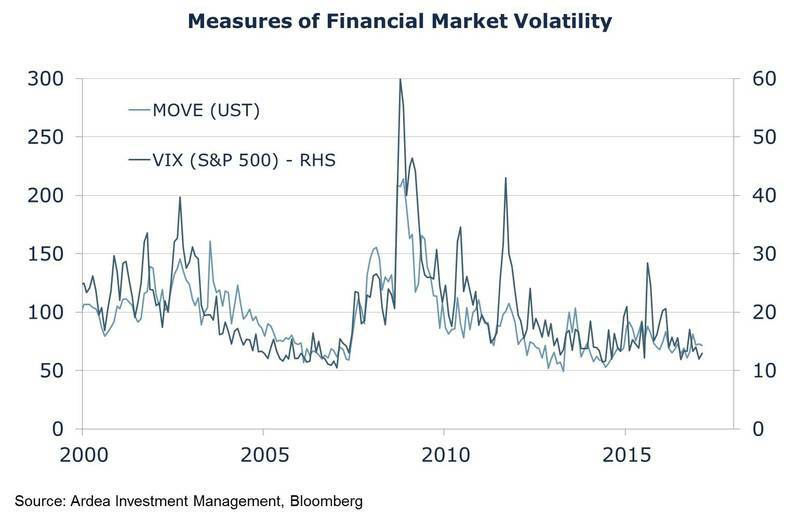 Thus, a volatility graph that is sitting at record lows infers a higher risk of a sharp reversal in investor views – but also an opportunity to buy protection cheaply before the crowd changes its mind and to profit from an increase in market expectations of volatility. The implications for investors are that protection against rising inflation can be accessed very cheaply. The prices of inflation linked bonds are currently inferring that inflation will stay at or below the low end of central banks’ inflation targets for twenty to thirty years into the future. Inflation can be “locked in” by purchasing ILBs at current rates, such that the investor is hedged against any future increases in inflation. Even if inflation were just 1 percentage point higher, this represents a 1% gain for investors each year, with further gains accruing if inflation were to rise more aggressively. 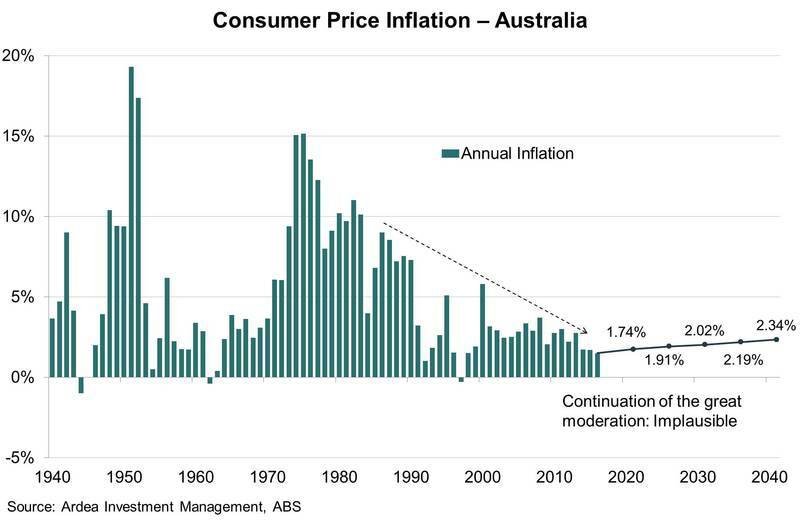 We have implemented variations of this strategy in the Australian and US inflation markets. Furthermore, by explicitly ensuring that investors are paid the rate of inflation over the life of the bond, the uncertainty around inflation is entirely eliminated. The interest rate that inflation linked bonds (ILBs) are quoting is therefore a yield over and above inflation, known as a real yield. This is why the quoted rate on an ILB looks lower – because the inflation component isn’t quoted upfront. As real yields don’t include any inflation assumption, they are often seen as a proxy for pure exposure to economic growth expectations and the demand for financing. As bond prices move inversely to yields, this means inflation linked bonds stand to benefit from any fall in real yields. This could occur if economic growth expectations start to falter, such as Trump’s economic stimulus plans failing to reach currently lofty expectations. So, in conclusion, investors can profit from ILB’s if multiple scenarios playing out (higher than expected inflation and/or falls in growth expectations), making them good defensive investments. From a volatility perspective, there are a range of fixed income derivatives that allow us to take advantage of the current low levels of expected volatility in the market. These include bond options, which provide the right to buy or sell government bonds at pre-set prices, as well as swaptions, which are options to enter in swap contracts at preset yields (with swaps being another way to gain exposure to rising or falling interest rates). The fact is that when expected volatility is low, the prices of these instruments are lower as well. Furthermore, many speculators as well as borrowers like corporate treasury departments upon seeing this low volatility have sought to sell options to gain an upfront payment and take on the risk that volatility will continue to stay low. In a low-rate world where investors are desperately seeking more return or where corporates are trying to lower their funding costs, this might make sense. However, this practice also creates an opportunity to buy options cheaply which benefit from a sudden change in volatility – providing valuable portfolio protection at minimal cost. The great thing about option-like instruments is that they increase in value if volatility increases, so they provide insurance-like protection as well as the potential to see value increases from the position even prior to needing the insurance-like benefit. We are seeing cheap optionality present in large quantities and have been buying it for client portfolios, given our view that markets may be complacent and the risk of a sudden change in expectations could happen quite quickly. This reflects good portfolio management and simple common sense. It is better to have insurance before it is needed – when you need it most it often isn’t available at a price that makes it worthwhile!